According to YOUKYUNG LEE, AP Technology Writer, Smartphone Cameras will step closer to high-end camera with sharper and clearer image quality this year. Samsung Electronics Co. has beefed up the camera in its Galaxy S5 smartphone due for April release and added smarter camera software, following Sony and Nokia in their upgrades of handset cameras. The tweaks mean smartphone photos, ubiquitous nowadays because of social media such as Facebook and Twitter, will be closer in quality to images captured by digital single-lens reflex cameras, also known as DSLR. How to give a super-thin smartphone the power of a DSLR camera that can capture moving images with clarity is a key challenge for the likes of Samsung, Sony, Nokia and LG as they try to differentiate their offerings in a crowded handset market. Their efforts to make smartphone cameras more powerful have taken a toll on the compact, point-and-shoot camera market, but catching up to the high-end cameras used by professional photographers had appeared a far-fetched ambition. The gap is getting narrower thanks mainly to improvements in camera software and other technologies, but may never close completely. 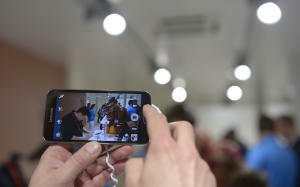 The global wireless show that wraps up in Barcelona on Thursday showed smartphone makers using software trickery to offset their camera weaknesses: inferior image sensors and lack of optical zoom lens. The companies are also making photo manipulation on the phone easier to learn than manually controlling DSLR cameras. Instead of touting their smartphones as thinner, lighter or bigger screened, Samsung, Sony and LG were boasting how their latest mobile gadgets can record ultra-high definition videos known as 4K, take big-pixel pictures without a second of delay and capture clearer images even at a low-light settings and when a subject is moving. One trend in smartphone camera this year will be phase detection autofocus, previously available only in cameras with interchangeable lens, said Chris Chute, a director at research company IDC. 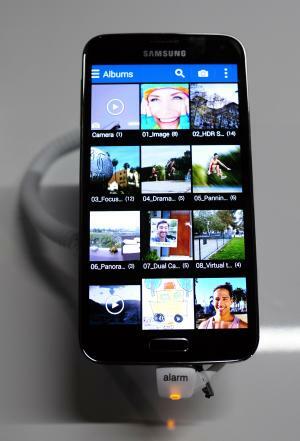 Samsung showcased the feature in the Galaxy S5, the latest version of the South Korean company's flagship smartphone. It reduces the time it takes to focus on a subject to 0.3 second so even when the subject is moving, the image can be captured with a sharp edge, said Seshu Madhavapeddy, Samsung's senior vice president for product and technology. "Now that phones are starting to have this, consumers will only be more likely to use phones for not just everyday pictures, but more and more for special event photography," Chute said. With the 16 megapixel rear camera in the Galaxy S5, it is possible to preview the result of applying high dynamic range imaging to pictures. HDR imaging usually helps create better pictures but with digital cameras, it is processed after snapping a photo. Samsung and LG also showed how their high-end smartphones can selectively blur and sharpen a picture by tapping the area a user wants to adjust. This feature, which adds depth to a photo, was a major trait in DSLR cameras. While DSLR cameras did this trick in the image's raw data by changing the lens aperture, Samsung's S5 and LG's G Pro 2 do it through software. Nokia and Sony said their latest smartphones have similar features. Nokia is also betting big on powerful camera features to lure buyers from Samsung and Apple Inc. Among Nokia's major products is the Lumia 1020 smartphone announced last year, which can take 38 megapixel images. Larger pixels in the camera don't necessarily mean a better picture, which also depends on the lens and image sensors. But bigger pixels allow taking photos with sufficient details for poster-size prints, something that professional photographers are keen on. Other high-end smartphone cameras are around or below 20 megapixels. Sony's Xperia Z2 smartphone, announced at the Mobile World Congress, has a rear camera with 20.7 megapixels, same as the predecessor Z1, but Sony upgraded the camera's video-recording power to 4K. The Z2 is also equipped with technologies that allow users capture to moving subjects blur-free. All these handsets from Samsung, Sony and LG can record ultra-HD picture quality video, something that isn't widespread among digital cameras. "This trend is happening much faster than most predicted," said IDC's Chute of the 4K video recording in high-end smartphones. But will these moves push smartphone cameras to reach the market reserved for premium cameras over $1,000? "You're getting to the stage where cameras in high end models are good enough for the majority of consumers in most environments," said Nick Dillon, a senior analyst at Ovum. But there will be a significant quality gap between the pictures from DSLR cameras and smartphones for the foreseeable future, he said. One reason is the sensor. The larger the sensor is, the better the image's quality. "There is a limitation in the sensor size you can put in smartphones because it would make smartphones bigger," Dillon said. And that's one crucial reason why professional photographers haven't swapped their cameras for smartphones. Smartphone cameras have yet to match high-end digital cameras especially in low-light settings, said Jun Michael Park, a freelance photo journalist in Seoul. "I still wouldn't switch. Smartphone's small camera comes in handy, but when I take pictures I always think about getting it printed, having a show, or getting them published," Park said. Winning over photographers like Park could be the next trophy for smartphone makers.